Welcome to a classroom where diversity is not only normal, it's what makes this school so special. Starring children of all races and religions, wheelchair abled and not, childhood shines with its acceptance of everyone. Happiness simply glows off the pages as the students play their musical instruments and paint their pictures and hear the dinosaur story over on the storytime rug. This is a celebration of what we can be together. Simply being children and gathering as families to celebrate the moon. So grab someone's hand and join in the circle. An outstanding book about the glories of accepting one and all. 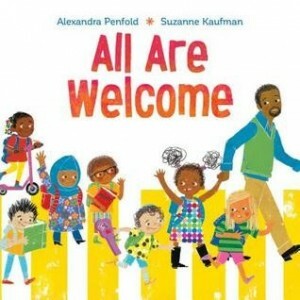 Regardless of where you come from, what you wear, how you get around, all children are welcome in this classroom and this book celebrates individual's diversity as well as inclusivity. This could, and should, be a snapshot of any classroom anywhere, as families of all types and origins connect to share their children's education. It clearly shows that however different the children's home lives are (and we get a glimpse of those in the illustrations) children everywhere love to do and learn about the same things. Though the rhyming text might be a bit saccharin in some places (although other reviewers have called it "almost radical in our polarized time") there is much that the teacher librarian and classroom teacher can take from the illustrations particularly to acknowledge and the diverse heritages of our students. From creating a display of national flags and sharing the various words for hello, to having students create displays of their homelands to coincide with national days or having parents who are fluent in another language come in and tell stories in their language to other students, it all helps the student feel that they are indeed welcome here.